Hi there! Hope 2010 is getting off to a great start for you. I can tell you that on our end, The Beagle is simply relieved that he isn't in a crockpot as on past New Year Days! Poor Pokey. I wish I could say we brought the New Year in with some serious partying....but, sadly, we were in bed at 8! However, before you get the wrong idea, we aren't that boring...we'd just gotten back home from a flight across the Atlantic. For Christmas, Edgar and I went on a magical...though at times a little frightening...trip to Amsterdam. Amsterdam is wooooonnnnndddderful...beautiful...terrific...it's just that we left on Christmas Day, flying through Detroit and, unbeknownst to us at the time, got on the same plane as the failed terrorist attempt hours earlier. Scary stuff. I think what was scarier, however, was flying back to the U.S. from Amsterdam. 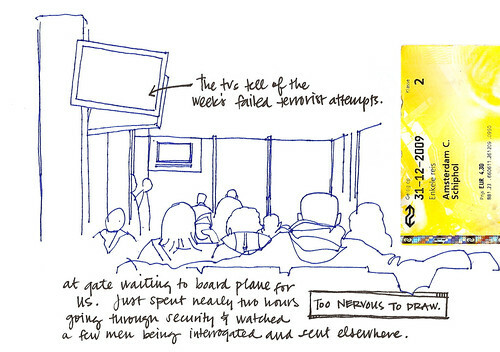 Thankfully, the security was VERY intense, but it was still a little surreal sitting at the gate, thinking who had been there and what he was planning days earlier. Phew. I'm so happy to be home. Glad to see you made it. ( there and back) Hope you got some sketches from inside Amsterdam to share! Happy New Year. Yikes! I get nervous on planes under normal conditions, so that must have been awfully unnerving! 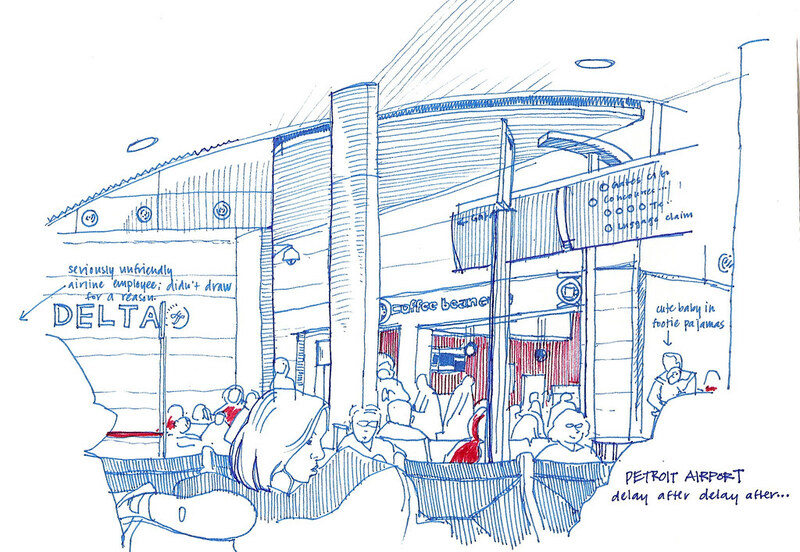 I like your airport sketches, though. You have cool handwriting. I, too, am glad that you're home safely! Oh man that is stressful! Me and my parents flew back from England on the 29th and security was pretty intense then. Somehow, we had some museum clay in a plastic bag in one of our suitcases and they thought it could be plastic explosives or something...we had a bad moment thinking they wouldn't let us on the plane. I can't wait to see what you sketched in Amsterdam too! Glad you came back safely! your in transit posts are my favorites! so glad you had a good trip to amsterdam despite the scare. glad to hear you're safely home!! how frightening! Oh gosh. I'm sorry your trip was a little spoilt. I flew two days after 9/11 so I know how freaky that is. The burning question is, though, did you, by any chance, try to eat a piece of artificial fruit? Or think you were wearing a hat? GREAT sketches by the way! Love the top one. Can you give us some lessons on perspective? I really want to learn, and you are the master. Glad you were able to relax and draw a little after the bumpy start!